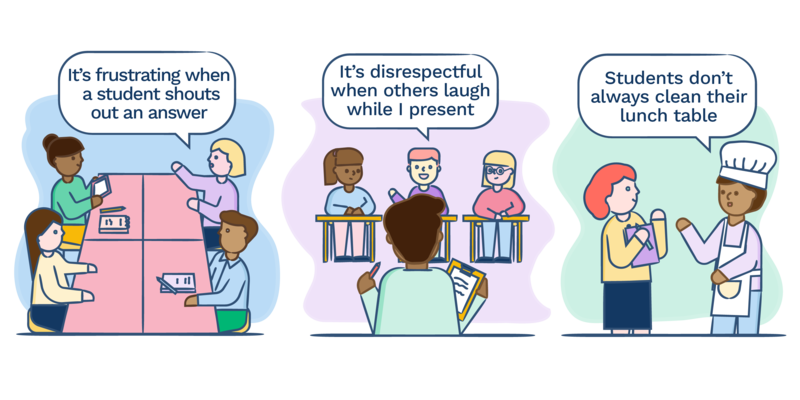 When it comes to identifying common negative classroom behaviors, you probably already know the importance of getting input from everyone involved. The gym teacher runs into issues that never affect the 7th grade English teacher or guidance counselor, who spend decidedly less time reigning rowdy kickball games. Plus, they probably all have different ideas for addressing those behaviors. 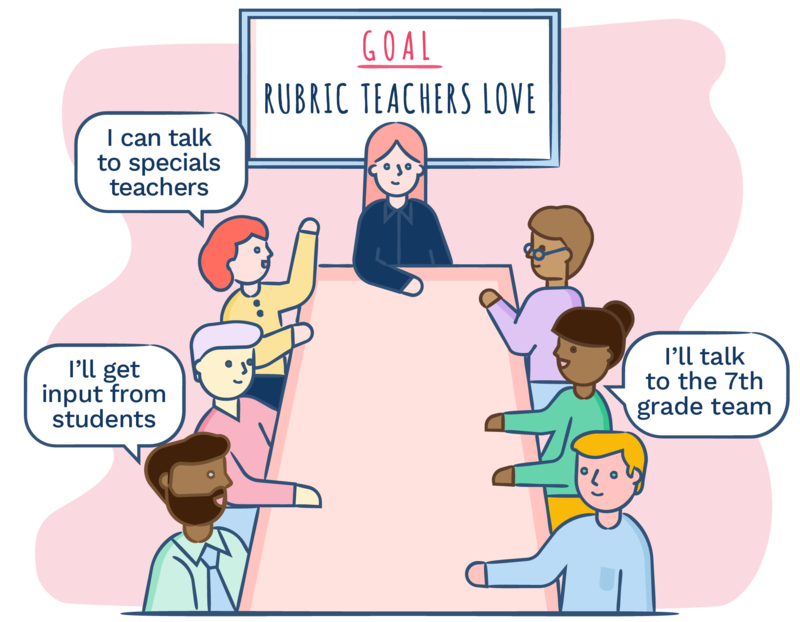 Your school’s PBIS Committee needs to make sure that every voice is heard in order to develop a behavior rubric that everyone believes in. But getting useful feedback from so many different groups could be a logistical challenge. Here, we’ve laid out a few of the best methods for getting input from all of your key stakeholders, designed to be led by your PBIS Committee. 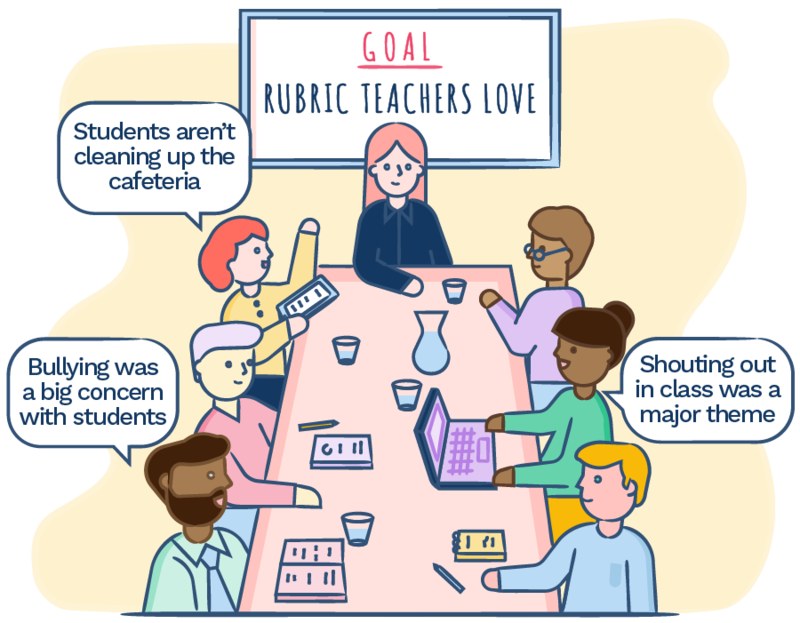 Chances are, you’ve already begun some sort of small group discussion (even if it’s just a few teachers and committee members tossing around ideas in the lounge). This is one of the best ways of gathering feedback, but it’s important that you have a planned approach. Organize these group discussions in advance, and make sure your small groups include all key stakeholders – grade teams, specials teachers, administrators, other support staff, and you might want to include parents and students. The more ideas and perspectives you have, the more complete your final behavior standards will be. We recommend giving each PBIS Committee member their own assigned groups to round up. So a 9th grade teacher on the Committee is the perfect point person to gather feedback from the rest of the 9th grade teachers. A guidance counselor might be a great liaison for parents or administrators. Maybe you’re ready to gather the troops (all of them) into one big think tank. More people requires more organization, so get prepared. In order to get meaningful feedback from a group this size, you’ll want to assign someone as the moderator. Establish a time limit for comments (and stick to it). Come up with a general outline for the discussion, and put it in writing for everyone to review beforehand. Keep in mind that some people may not be comfortable voicing their opinions in front of a large group. You may want to seek out feedback from the quieter members afterward. It might sound daunting, but there are some notable advantages to a big discussion like this. It gives everyone a chance to hear and discuss each other’s point of view firsthand. And with this many people in the room, you’re guaranteed to get to get more than enough input. Just make sure the meeting is carefully managed so you can make the most of everyone’s time. A survey is one of the easiest and fastest ways to gather feedback. It’s not very time consuming on your end or theirs, and it’s a good way to make sure the same information is gathered from all parties. But choosing from a multiple choice list and typing a two-line short answer isn’t always conducive to setting classroom behavior expectations. While you’ll get direct responses to your questions, you may miss out on additional feedback that parents, teachers, and others may have volunteered during an in-person conversation. If you’re pressed for time and you decide to go this route, there are plenty of free tools that make your job even easier, like SurveyMonkey and Google Forms. Both of these survey platforms are user-friendly - perfect for a busy PBIS Committee. Regardless of the option you choose, it’s vital that your PBIS Committee pick a strategy and plan ahead. Think about how much feedback and detail you need, and how much time you can spare. Once you have a plan in place, the task of gathering input from everyone will seem much more manageable. Have you tried any of these methods yet? Let us know how it went! Tweet @whyliveschool or share your story with @liveschool on Facebook.